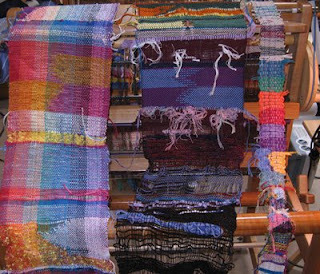 Last summer my mom and I went to Saltspring for a weaving retreat with Terri Bibby, after Ryan and I initially met Terri at the Saltspring Fibre Fest. It was a fantastic weekend of weaving, amazing what you can do with a 2 shaft loom! The philosophy is what really struck a cord with me. Saori translates into zen weaving and once learning this philosophy I have come to apply to many other aspects of my life and fibre creations. Which is another story for another day. Looms can be provided if registered in advance , so if you are interested, please email me to register at info@kbnfibres.ca.